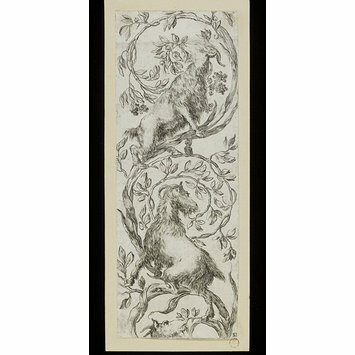 Ornamental design featuring two goats. Stefano della Bella, from a suite of 12 plates, including title plate, entitled 'Ornamenti o grottesche'. French, ca.1645. de Vesme, Alexandre, and Massar, Phyllis Dearborn. Stefano della Bella: catalogue raisonné. (Vol. I.) New York, Collectors Editions, 1971, pp155-156, no.1006.